Full-shade growing can create challenges, and full shade tolerant ground covers can help gardeners and landscapers meet those challenges. Many different types of plants can serve as a full-shade ground cover, from creeping vines to plants which spread by mats of rhizomes or delicate woodland wildflowers. Choose the best full shade ground cover for your growing conditions after considering the many options available. Full shade, whether on the shadow-side of a building or under a dense-canopied tree, will kill off most lawn grass, often leaving nothing but bare dirt, which wears away underfoot and creates clouds of dust when mowing. A full-shade ground cover provides an attractive green planting in lieu of grass to retain soil, hold in moisture, and keep down the dust. Ground covers have the added benefit of not requiring mowing. 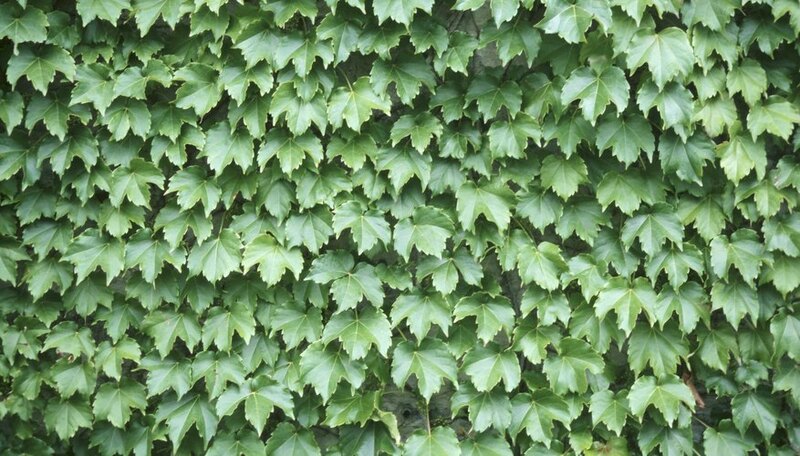 Full-shade ground covers include evergreen vines such as vinca minor (periwinkle), pachysandra, winter creeper and English ivy. Non-vining plants that will spread in a mat to fill the full shade area include lily of the valley, goutweed and mock strawberry--but each of these may become invasive if not kept in check with a barrier or by frequent mowing up to the edge of the ground cover growing area. Larger individual full-shade plants that will expand to cover the area include hosta, ferns, cotoneaster and sweet woodruff. The fastest growing full-shade ground covers include lily of the valley, goutweed and bugleweed (Ajuga reptans), all of which require moist but well-drained soils. Native woodland plants may take several seasons to get established, and also disappear after the spring blooming season, such as trout lily, Jack-in-the-pulpit, and trillium. While these woodland wild flowers are beautiful, they might not work for gardeners who have a short time frame for establishing a thick ground cover, or who need the ground cover to remain thick and green throughout the growing season. Although full-shade ground covers are hardy, they are not wholly without need for care and horticultural attention. Full-shade ground covers are often competing with shallow tree roots for nutrients and water, and full shade in the lee of a building wall is often dry as well as dark. Weed out stray bits of grass or other unwanted plants from the ground cover and apply a top-dressing of compost annually. Water the shaded area whenever the weather has been dry. Determining which full-shade ground cover is best depends on your growing conditions and aesthetic goals. Beach wormwood and cotoneaster are highly drought tolerant, while bugleweed and periwinkle prefer moist, rich soils. Lily of the valley and wild ginger are lovely, but can become invasive. Native woodland flowers compete well with tree roots, but nearly disappear after blooming. Evaluate the soil, moisture, and climate factors at your location, then determine your landscaping goals for the full-shade area, and consult your local nursery supplier or cooperative extension office for the options which best meet your needs and goals. What Types of Pavers for a Shaded Area?